Actually, I've been back in Santa Fe for about 5 out of 8 weeks of my contract. We've been working a lot to get to this, the opening weekend. There has been hiking, biking, and shopping as well. Best of all, I was asked to knit a scarf for the character of Falstaff in the opera of the same name. And, I GOT PAID! Yes, paid. It was fun and very free form and textural. I may never get this type of opportunity again as knitting for live theatre is not an affordable option for most costume budgets. Anyway, things are going really well out here but at the moment I'm kind of tired! I hope everyone out there is good and having a fun summer. Yeay! I love that you god paid to knit. That's so awesome. How are you lady? I miss ya! 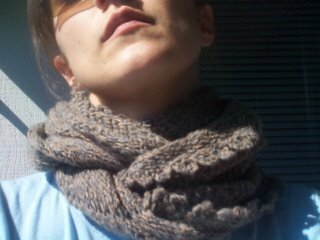 That's so funny...someone asked me to knit a scarf for a play this year. It was intarsia and needed to be done in less than a week. Ha! I thought I had your e-mail address saved but I can't locate. Where will you go after graduation? Talk to you later!